WH changes your desktop wallpaper on the schedule you choose and with the pictures you want displayed. Any jpg, gif, or bmp pics can be used, including animated and transparent gifs. Oversized pics are resized to fit your monitor; smaller pics are centered, tiled or stretched. Easy to use, just add your favorite pictures and set for hourly, daily, or weekly. Includes a slideshow screensaver with animated transitions that resizes oversized photos. ...... Preferences for smaller pictures can be set to centered, tiled or stretched. Easy to use, just add your favorite pictures to the Wallpaper Hanger folder and your desktop wallpaper will change hourly, daily, weekly or every 15 minutes if you have a short attention span. Also includes a slide show style screen saver with animated picture transitions. 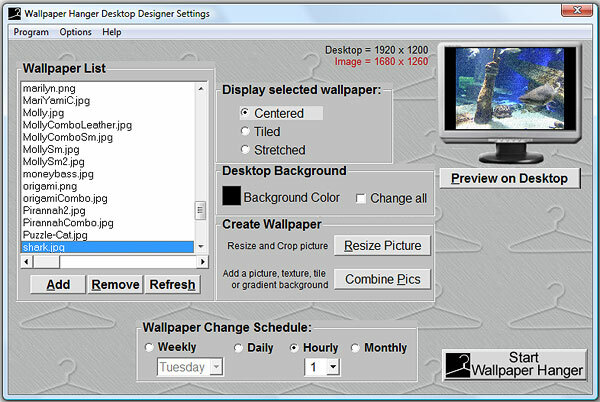 Screen saver will resize oversized photos to fit your screen. Schedule when your desktop wallpaper changes with a user defined time interval. Randomly change wallpaper, supports multiple formats and multiple folders. Changes the desktop wallpaper automatically. Position the pictures to suit you. Qweas is providing links to Wallpaper Hanger 1.0.2 as a courtesy, and makes no representations regarding Wallpaper Hanger or any other applications or any information related thereto. Any questions, complaints or claims regarding this application Wallpaper Hanger 1.0.2 must be directed to the appropriate software vendor. You may click the publisher link of Wallpaper Hanger on the top of this page to get more details about the vendor.